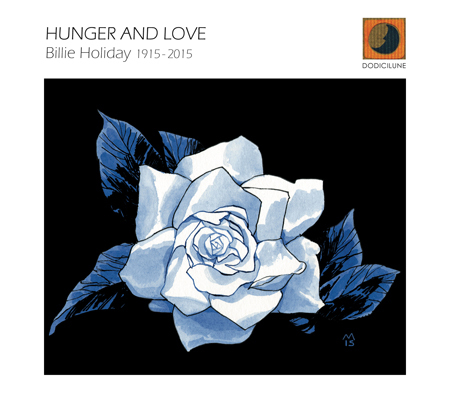 On the occasion of the hundredth anniversary of Billy Holiday's birth, the Apulia record label 'Dodicilune' has thought of and then given life to a tribute to the great afro-american singer, creating something really powerful in order to celebrate her talent along with her voice & personal life, all of it rendered possible thanks to the collaboration between 24 italian jazz singers, each one providing, according to their own sensibility, a very personal, meaningful interpretation of her art. The final result's a lovely double cd of astounding artistic quality. A profound, sensible reread of all Billy's passionate, emotional afflatus. First of all a woman, a jazz singer who has known hunger and misery, alienation, discrimination and suffering due to not being accepted, and still abandon, drugs and brothel misery, success and regrets. The double album we're referring to is a tribute of strictly courtly genre, all 24 artists challenged themselves by forging a great performance not only limited to a simple didascalic, mere standard reinterpretation of the legendary 'Lady Day', but they've clearly internalized all lyrics, making them all the more incisive and modern. Tiziana Ghiglioni, Paola Arnesano, Gianna Montecalvo, Serena Fortebraccio, Lisa Manosperti, Serena Spedicato, Mara De Mutiis, Camilla Battaglia, Letizia Magnani, Cecilia Finotti, Chiara Pancaldi, Antonella Chionna, Rachele Andrioli, Francesca Ajmar, Silvia Anglani, Marta Raviglia, Loredana Melodia, Cristina Renzetti, Stefania Paterniani e Elisa Ridolfi, Lisa Maroni, Silvia Manco, Elisabetta Guido, Barbara Errico, Elga Paoli, are at their best, and they proved, would there still be a need to, that, when it comes to Italian Jazz, female voices offer large, mature awareness when performing repertoires people consider almost 'sacred'. Everything's treated with due respect, even when the artistic interpretation and arrangements become somehow daring, to the point of completely reinventing, deconstructing a song, and yet no irreverence or disrespect would be found. Personally, as previously stated, I think that this double album's surely an unmissable mix of music & vocals quality, a must-have for all those in love with the goddess and those in love with jazz voices, or for the newbies even. Arrangements are truly refined, recording quality's of a very good level, tested in my hi-fi systems: sound was never tiring and there was no dynamic range compression, either. - Don't explain, with a persuasive, convincing Barbara Errico. 24. Gianna Montecalvo (vocals), Gianni Lenoci (piano). An extremely enjoyable double album, a worthy tribute to such an inspirational muse.